Chinese car manufacturer Shuanghuan Automobile’s ‘CEO’. BMW claims the CEO closely resembles a pervious version of their X5 ports utility vehicle that was discontinued in 2006. BMW is going after Shuanghuan Automobile, a Chinese car maker that hopes to break into Europe, on charges that its sport utility vehicle, the CEO, is a copy of BMW’s popular SUV, the X5. The German car maker has filed a lawsuit in Munich to prohibit the sale of the CEO in Germany. Shuanghuan’s European importer defied BMW by exhibiting the car on the first day of the Frankfurt International Motor Show on Tuesday, providing a vivid glimpse of the low-grade war over intellectual property rights between China and the West on goods ranging from designer handbags to computer chips. “We did not like it," the chief executive of Bayerische Moteren Werke (BMW) Norbert Reithofer said during an interview here. Neither did DaimlerChrysler, which is taking legal action against Shuanghuan to prevent it from selling the Noble, a little car that bears an uncanny resemblance to the Smart mini car made by Daimler. The Noble did not turn up at this show, though the importer, China Automobile Deutschland, insists that it has decided on its own not to distribute the car in Germany. “Naturally, our cars are inspired by European car makers," said Karl Schlössl, a German who is the chief executive of China Automobile. “But we reject the charge that these are copies." Schlössl seemed to be revelling in the dispute, which catapulted his Chinese brand from obscurity to centre stage at this auto show, traditionally dominated by the titans of German auto making. At a circus-like news conference, Schlössl refused to speak the name BMW, instead humming it. He spoke of having a southern German accent that would make him at home in the hallways of BMW, based in Munich, and he introduced a tall blonde woman as his companion. Still, there are serious issues behind the theatrics. Few European executives doubt the Chinese will be genuine competitors here in a few years—perhaps learning faster than the Japanese or the Koreans—despite a bumpy start in the market because of safety concerns with their first cars. And with the web of alliances between Chinese and Western auto makers, there are plenty of opportunities for European innovations to turn up in Chinese cars that are then peddled to Europeans. General Motors and Honda have accused Chinese car makers of copying their designs—often slavishly—but have gotten little relief from Chinese courts. Some analysts said the European manufacturers needed to accept copying as the price of doing business in China. “There are three copies of the Smart," said Graeme Maxton, an independent auto analyst in Hong Kong. “When it comes to body panels, I almost sympathize with the Chinese; it’s not that big a deal." Maxton said Chinese car makers sometimes copied the exterior of a car from one model, and the interior from another. 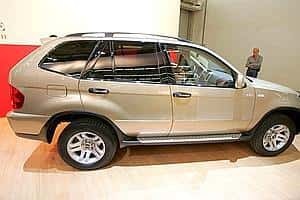 In the case of the CEO, it is not even clear that the BMW X5 was the only source for the outside. Automobile critics have said that while the rear end of the vehicle is a dead ringer for the X5, the front end is reminiscent of a Toyota Land Cruiser. BMW emphasized that under the hood, the CEO was no X5. Small wonder: The X5 starts at €59,000 (about Rs33 lakh) in Europe; the twin turbo diesel model on display here goes for €92,000. Schlössl said the CEO would sell for a base price of €25,900. “Someone who buys a BMW for €100,000 is not the same person who will look at a CEO," he said. “I think it’s confusing to our customer base," said DaimlerChrysler’s chairman, Dieter Zetsche. “Showing a vehicle that looks very similar to a car on our stand raises unnecessary questions." DaimlerChrysler and BMW have manufacturing operations in China, and neither seemed keen on turning the dispute into a broader offensive against China. Zetsche and Reithofer said they believed the Chinese government would protect intellectual property more zealously as their own engineers begin turning out original technology. But Zetsche acknowledged there were likely to be further such flare ups, as China develops its industry. “In Asia, in general, the culture does not define copying as something bad or unethical," he said.